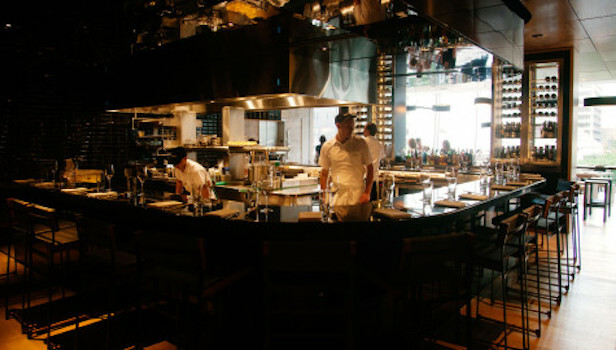 David Chang has been extremely successful ever since he opened his first restaurant in 2004. Chang now owns a series of “Momofuku” restaurants in NY, Toronto, Sydney and Washington (a group that includes Momofuku Noodle Bar, Momofuku Ssäm Bar, Má Pêche, Momofuku Ko, Momofuku Milk Bar, Momofuku Seiōbo, and Momofuku CCDC). Though the word "Momofuku" might best translate from Japanese to English as the words "lucky peach", Chang has gone on record in saying that the name is meant to recall Momofuku Ando, the Taiwanese-Japanese inventor of instant ramen. It’s therefore not surprising to learn that Chang’s early days in cooking were marked by an exposure to ramen outlets. Momofuku Shoto in Toronto is a currently super hip place that is characterized by easygoing service and well spaced out tables (always a blessing, in my mind). The food is unpretentiously served, and the place offers a laid back atmosphere in which to enjoy well cooked, sneakily complex food. The most enjoyable dish on this night was the crispy chicken bun with ssäm sauce. I really could have gobbled five or six of these down all at once, and all by myself. You’ll find that ssäm sauce is a staple of just about every Momofuku restaurant anywhere. It’s made with traditional gochujang (also spelled kochujang), a Korean chili pepper paste that is spicy, tangy and umami-rich, and a seasoning that nicely kicks up a notch the flavor profile of the likes of steamed buns and fried chicken. The rest of the dishes I tried on this night were perfectly fine if not especially memorable. They were hearty, flavorful and well cooked. Wine service is quite good at Momofuku Shoto. The sommeliers are both friendly and knowledgeable. I started out with the lovely NV Blue Mountain Brut Gold Label, a Canadian sparkler form British Columbia, a roughly 60% Pinot Noir/35% Chardonnay/5% Pinot Gris blend that spent two years on its lees, but was bright and flavorful with not much in the way of leesy or buttery-hazelnut character. Overlooking Vaseux Lake in the beautiful Okanagan Valley, owned by the Mavety family, Blue Mountain is one of the country’s premier wine estates, one that boasts forty-three years of continuous grape production by one family, clearly a rarity given Canada’s relatively young fine wine history. Next up I couldn’t resist trying a Cabernet Franc from Prince Edward County in Ontario, one of Canada’s up and coming star wine regions. The 2013 Stanners Vineyard Cabernet Franc is yet another example of just how well this grape variety has adapted to Ontario, where a bevy of great Cabernet Francs are being made; I can’t help but find exciting just how good many of these wines are, especially if you stop to consider the relatively young age of the vines. Stanners Vineyard is a family venture that began in 2003 with the intent of producing a world class Pinot Noir (Prince Edward County is very rich in limestone soils and the climate, though extremely harsh in the winter, also harkens back to Burgundy somewhat). However, the Cabernet Francs made here have also been extremely successful, and this one was just dripping with gorgeous red cherry and pomegranate fruit aromas and flavors, lifted by bright natural acidity, finishing smooth and complex. Last but not least, a sweet, fleshy Spanish red seemed to be the perfect foil for Momofuku’s spicy, flavorful cuisine. I chose the 2009 Bodegas Pintia Toro, and it proved to be the perfect way to close out the night. Made from steep vineyards located at roughly 600 meters above sea level in a hot microclimate, this 100% Tempanillo (locally called Tinta de Toro) from ungrafted 40-60 year old vines is redolent in notes of smoke, grilled beef, coconut and chocolate-covered espresso beans. Sweet and seamless, the 2009 will appeal especially to those who like their wines rich, ripe and ultra-smooth. The wine ferments in new French oak barrels and is aged twelve months in oak (of which 70% is French and 30% is American, 50% of the total are new, and you can tell). This bottle was in excellent condition and obviously had no problems with too much sediment, a concern that led Pintia's parent company, Vega Sicilia, to recall thousands of bottles back from clients offering to replace them with another vintage a few years ago. I walked out into the brisk Toronto night-time air feeling light but full, and looking forward to a return visit to Momofuku Shoto my next time in Toronto.